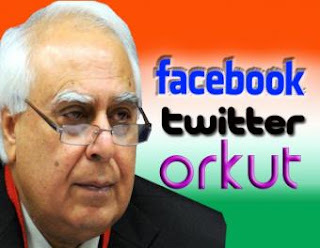 There as been an uproar in the social media after Kapil Sibal made clear, his intent of curbing freedom of expression on social media. Even though he insisted that he was advocating self-regulation initially, he has upped his ante by using words like code of conduct, sensibilities of people, offensive, stiff fines etc. It is clear what he has in mind is censorship. I could see it coming for sometime. The social media has brought in a change in the environment and given the power to the common man to voice his opinion. It is not that people were not having their opinions earlier, just that the audience they had was limited. Such a thing everyone could handle. But now that there is a possibility, rather certainty of the common man making his opinion reach a huge audience and make a difference the very guys who ignored him are now shivering in their boots. If it was so easy to spread negative sentiments on the social media, the Gandhians in the ruling party can use the social media to spread love and peace as easily. Why are they not doing it? Because, they understand that it is not so. Just like a single drop can cause a spill in the cup only if it is full, messages on social media can not cause a change unless the sentiment already exists. If there was no corruption in India, Anna Hazare’s tweets and updates would have gone unnoticed. So who is the social media hurting? The religious extremism of the Indian people has, more often than not, been fanned by these same politicians. Even today they continue to sustain a communal divide by recognizing minority communities. The people who partake in riots and communal unrest are the goons nurtured by these same politicians. The common man’s participation in such activities is restricted to suffering. It is hurting the politicians because they know that now there is a possibility of people getting on to the streets at a short notice. Mistakes and (mis)adventures are more likely, now than ever, to be noticed and questioned by people. They don’t want that to happen. It is hurting the industrial giants of India because earlier they could easily fool the people with lies about themselves and their products. But now people talk to each other on social media before taking any decisions. Lies don’t work anymore, only good products and services do. The marketing spend is going down the drain and profits are reducing. The industry giants don’t want that to happen. They could have prompted this move. The clause of defamatory content can easily be extended to a negative review about a product or company. That will surely help in curbing the truth and then companies can again go about fooling people with lies. Kapil Sibal, he is merely a pawn in the hands of the Gandhi family. The family which can conveniently revert a decision which backfires and equally conveniently take credit for what works. Apparently it was a caricature which started this hullabaloo. Why is it so difficult for them to take the negative sentiment in their stride and work towards changing it? Lastly if you have a habit of eavesdropping, in all likelihood you will be surprised or shocked about what others are saying about you. Why is Mr Kapil Sibal or anyone else for that matter trying to listen to what others are talking about? If they don’t, their sensibilities will not be affected. Unless of course, like Hitler, you want to go around and make people pledge their allegiance to father/motherhood and execute those who don’t. Instead of crying hoarse about the offensive material on social media sites the politicians and the industry leaders should use the social media to enhance their reputation online and engage with the common people to improve the governance/products. I am available should someone need it. The truth of the matter is that social media has given us the power to express ourselves and no government of the people, by the people and for the people should take away this fundamental right of ours.